Will the #DeMonetisation move cost the BJP Mumbai's Gujarati vote in the #MCGMelections? Being traditional BJP voters, Gujaratis in Mumbai have always been held in contempt by the Shiv Sena, a party that was formed to fight for the cause of 'Marathi manoos'. But now that the party has realised that it cannot retain the upper hand in the upcoming Municipal Corporation of Greater Mumbai (MCGM) without being allied with the BJP, it has put out the red carpet for Gujaratis in Mumbai in an attempt to attract votes. Gujaratis are a deciding factor in certain pockets of Mumbai. After the recent war of words between Shiv Sena and BJP, the alliance for MCGM elections is now only a remote possibility, and the Shiv Sena knows that not being allied in the forthcoming civic elections could prove to be fatal for it if it solely depends on Marathi voters. Also read - Nagpur Maratha rally sees low turnout. Has the agitation lost steam? Its efforts to lure Gujarati voters also makes it clear that Shiv Sena is preparing itself to face MCGM elections independently. As a part of the initiative, Shiv Sena, for the first time in its four-decade long history, has put up banners in Gujarati language to announce the housing policy formed by the state government. This was the first attempt to attract Gujarati community, and was followed by appointing Gujarati office bearers of various party branches in central suburbs such as Mulund and Ghatkopar, where Gujarati population is decisive factor. Interestingly, the Gujarati community leaders are reasonably eager to join Shiv Sena, particularly after the Centre's demonetisation move. Sources said that the Gujarati community in Mumbai is quite upset due to the decision. "Many have suffered losses in business due to demonetisation. No one would openly say it, but are discussing the same thing in hushed tone. It is a general feeling among the trading community that BJP needs to be cut to size in Mumbai and that the Shiv Sena is the best option to do that," said a senior Gujarati community leader. A Gujarati trader from Ghatkopar, who recently joined BJP from Congress, says, "It is the worst decision the Prime Minister has taken. It has crippled the business," the trader said. But a senior BJP leader said it would not affect the party's performance in forthcoming civic elections. "We have conducted our own survey about the feelings among masses post demonetisation. A majority of the people are happy, which include Gujaratis as well. Though a few heads might shift loyalties, by and large the party will be unaffected since Gujarati masses still look upon Prime Minister Narendra Modi as their icon. Hence, they will not go anywhere," the leader said. Even so, several influential Gujarati leaders from other parties are joining Shiv Sena. Sources said that the Gujarati leaders who joined Shiv Sena this week have assured party executive president Uddhav Thackeray a win in 15 seats. These leaders include Hemraj Shah, national spokesperson of Nationalist Congress Party (NCP), Jayantibhai Modi and vice president of Gujarati wing of Mumbai BJP Rajesh Doshi. "Hemraj Shah is a highly respected name in the Gujarati community of Mumbai. His words are rarely disrespected in the commercial capital of the country. He joining Shiv Sena is clear indication of the intentions of the Gujarati community," said another leader who did not wished to be named. A senior Shiv Sena leader requesting anonymity said, "We are preparing for any situation. After all, we cannot let go of our hold on MCGM at any cost. We also understand that Gujaratis must be roped in to maintain an upper hand in the civic elections." It is estimated that 15 lakh of the 35 lakh Gujarati population in Mumbai are eligible voters. They can be decisive in their respective constituencies for civic elections, where wining margins are very low. 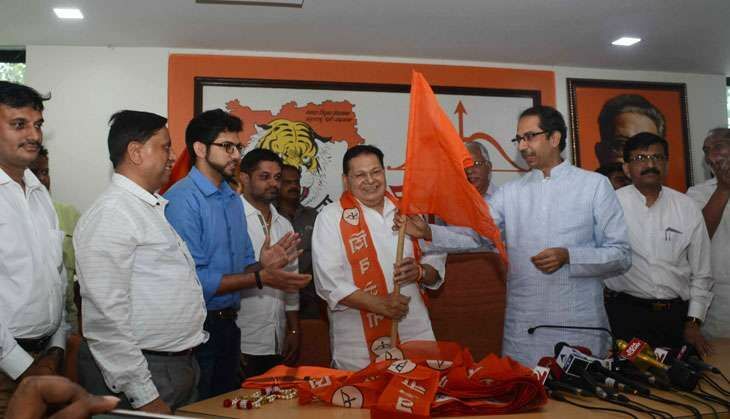 Sources in Shiv Sena said that the party started its reach-out programme soon after 2014 state assembly elections when it hosted several programmes for Gujarati and Marwadi communities in the city. In fact, the party has been making a systematic effort to reach out to all non-Marathi communities in Mumbai. Yuva Sena chief Aditya Thackeray recently visited Dadar Parsi Colony and interacted with the voters, who traditionally vote for the Congress and the BJP.